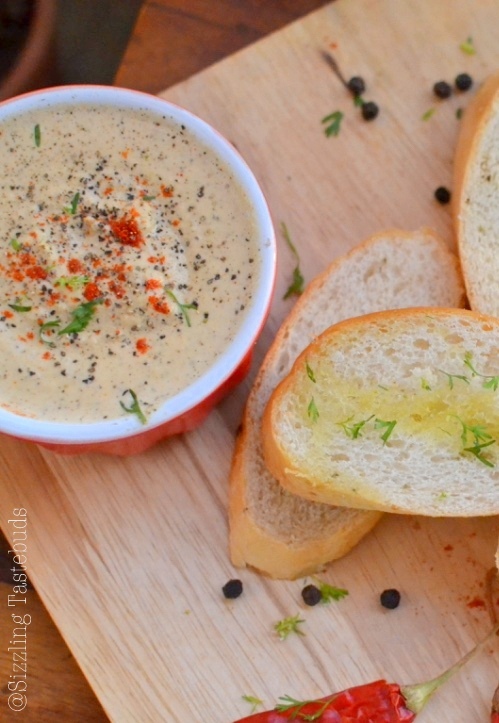 Chilli Cinnamon Almond Dip + a surprise giveaway ! When life gives you lemons, they say,make a lemonade. 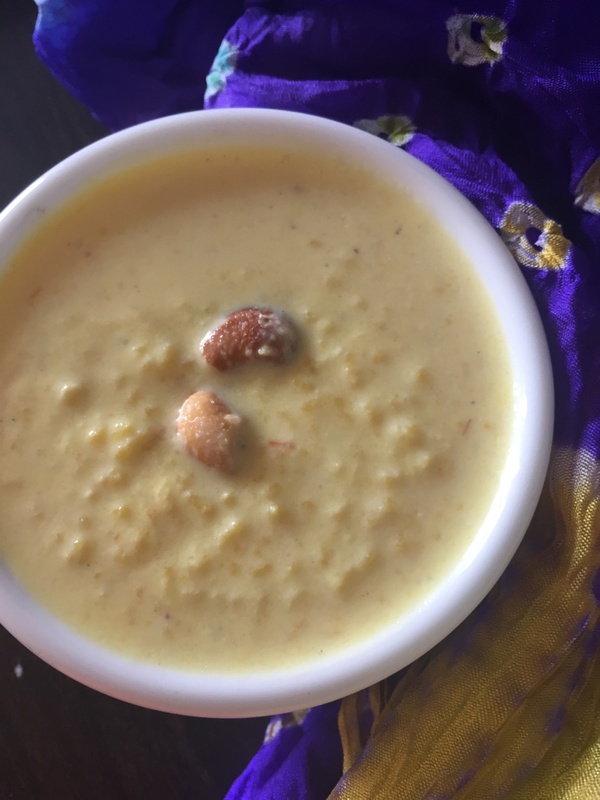 But when I was stuck with a whole batch of soaked Almonds (apparently to be made into Badam Katli (a.k.a Almond Fudge, but paused for lack of energy and time), I began to look for options which used up the soaked almonds. some of my BM friends gave me some options on our whatsapp group, & I made a batch of Almond Meal (to be used in these quick bread, muffins, kheer & cake recipes), but was wanting to make something else. As usual, trust the husband to come out with something totally quirky yet tasty. Made this delicious dip to go with the garlic bread, and coincidentally it was on my BIL's birthday so we all enjoyed this treat together. Do check out the details of the surprise giveaway to ONE lucky reader at the end of this post !! 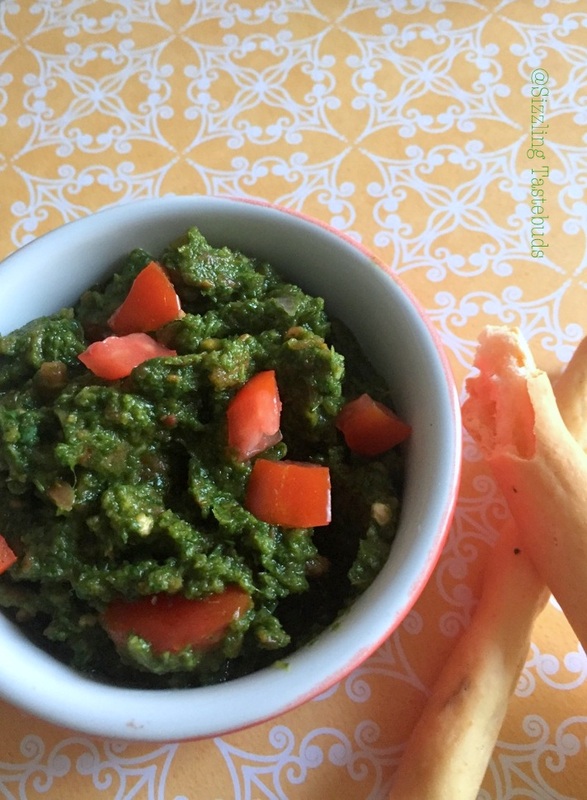 So, without much ado, lets check out the last of the posts this week on Dips; hope you enjoyed the other two posts : Coriander-Mint-tomato salsa & Thakkali Thokku (quick tomato pickle). In a blender, blend all except salt. Check for salt and add salt and spice powders accordingly. Mix well. Serve immediately with veg crudités / soup sticks or any bread :) Top with chopped parsley, some more olive oil, black pepper powder & cayenne pepper. 1) This dip keeps well upto a week under refrigeration. 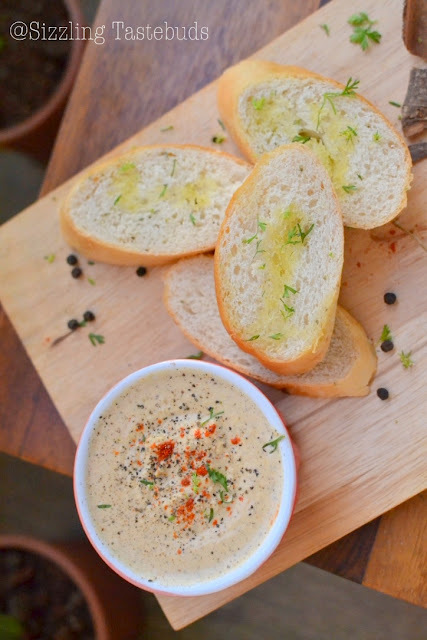 2) We found this to be a creamy moderately spicy dip. Adjust spice accordingly. 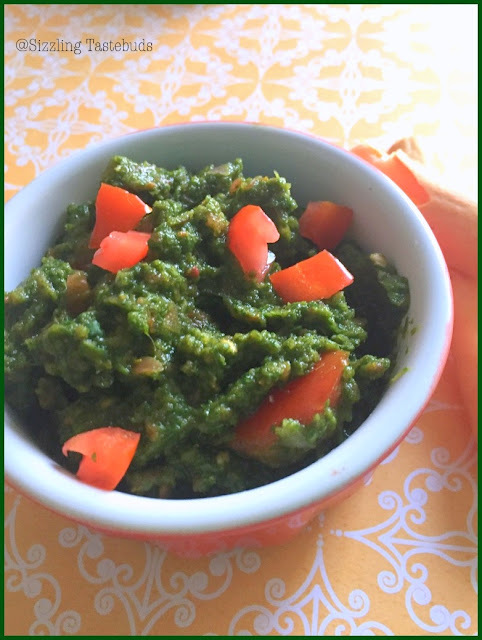 Saw this rather interesting Salsa / dip at a Medical Practitioners website and noticed that most of the recipes didn't contain any fat / oil and worked on the basis of vegetables releasing their own liquid and that helped in cooking. I tried a few recipes from that website, and this is one we loved a lot. Pair it up with pretty much anything from crudités to nachos to wafers or even chapati / tortillas. Its vegan, Gluten Free and fat free - couldn't ask for more, isnt it? Add the ingredients into a blender and blend them to make chutney. You might have to stop a few times to push the ingredients down towards the blades. Add a little water if required. Squeeze lemon at the end and mix well. Store in the refrigerator for up to 10 days or freeze. If I am to choose an universal dip / side dish in my kitchen that's so versatile that it goes well with anything from steamed rice to chapati to Idli to Dosa to Pongal to Curd Rice to Akki Rotti to Upma to Parathas (and everything in between), I would bet heavily on this dip - Tomato Thokku (or Quick Tomato Pickle). It was around the beginning of December when I made this first batch when my sister and BIL were visiting, and it vanished in a flash. 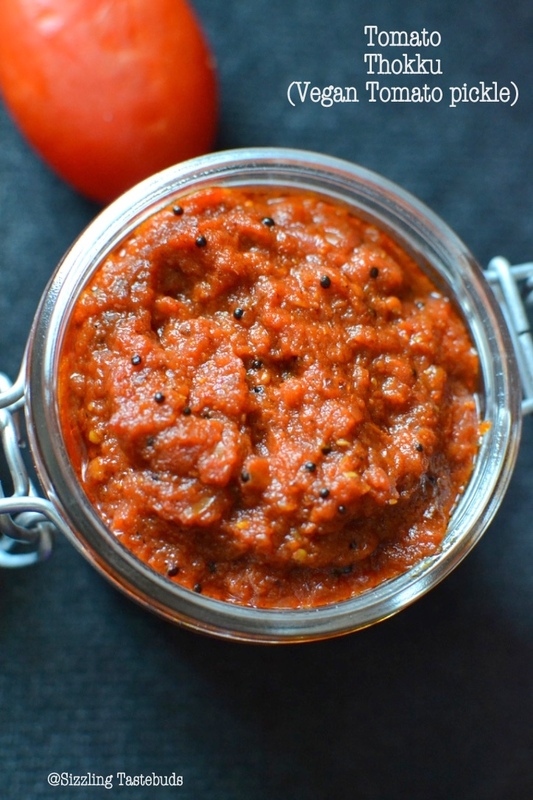 Keeps for 2-3 weeks under refrigeration; fresh batches can be made anytime during the year. Prep time: 20 mins, Cook time : 45 mins, Makes : approx 400 gms of dip / pickle. Wash and wipe dry the tomatoes . 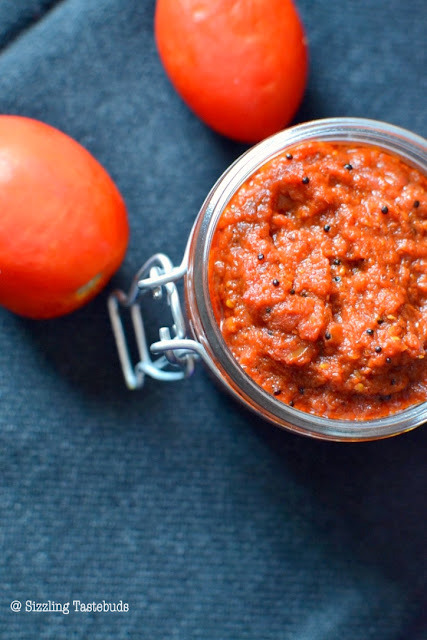 Cut the tops of the tomatoes, and using a food processor or knife, chop each tomato into 1/8, coarsely puree them with some chunks intact. do NOT add water at all at any stage during the entire pickle making process. In a deep pan, add half of the sesame oil. Splutter the mustard seeds and the asafoetida. Now add the coarse tomato chunk+puree mixture and turmeric. Stir once or twice, and let it cook covered for 8-9 mins covered till they are almost reduced by a third. 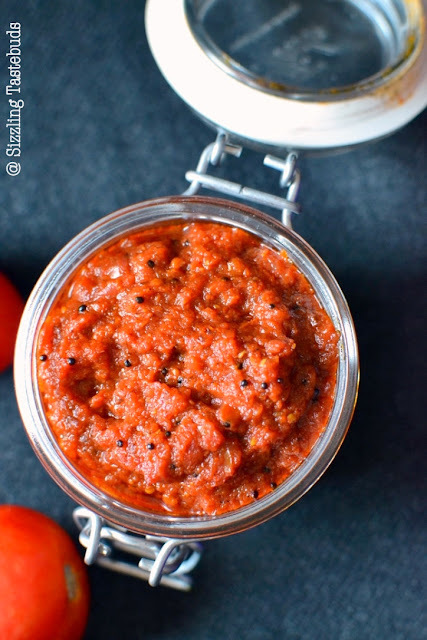 When you see the original quantity of tomatoes reduce to 2/3 or even half, add in the remaining oil, salt, jaggery. Mix and do a taste test and adjust spices accordingly. At the end of this stage, oil should start floating to the top (it will settle once bottled, so dont worry). Cool thoroughly and bottle in a sterile glass bottle. Refrigerate and use a portion with a sterile clean dry spoon as required. stays for 2-3 weeks under refrigeration. As its quite a spicy thokku, use in small quantities, especially to kids or anyone else who's not spice tolerant. The spice levels can vary depending on the quality / variety of the chillies used. Use your discretion for the same. 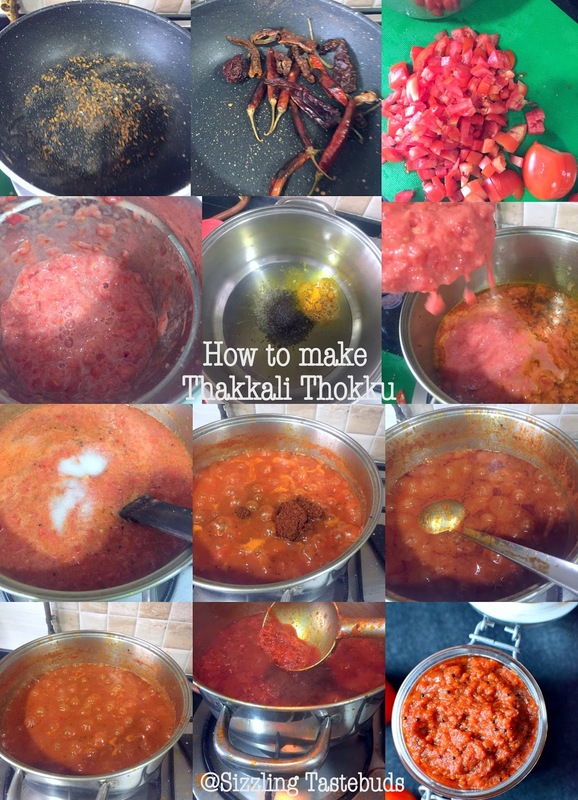 Some add garlic to this thokku, but we prefer this method. If using garlic, dice them fine and saute well before adding the tomato puree. Winter veggies make the most delightful of meals, and I await the fresh veggies that my local green grocer brings me to make Undhiyu, Palak Paneer, Aloo Methi and other local delicacies. Today is the last post in this week's festival series and lets see what we have here. 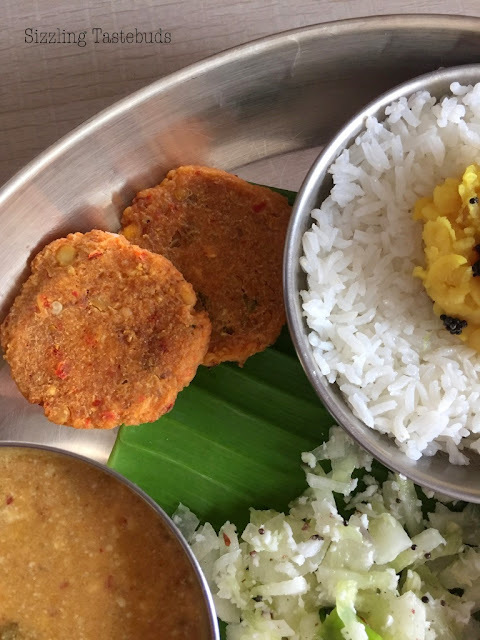 Oondhiyoo (aka Undhiyu) with Puri is another favourite dish in Gujarat to celebrate the local veggies that are typically grown only in winter. This is served with today's dish - Khichdo (Not to be mistaken for Khichdi) as a complete meal on Uttarayan. Khichdo served in both sweet and savoury versions, and I opted for the former. Adapted from here with minor modifications. Dry roast the lapsi for 1-2 mins till just warm (optional but recommended). Drain, add adequate water and pressure cook for 3 whistles. In the same pan, add milk and jaggery / sugar. Let it cook for a while. 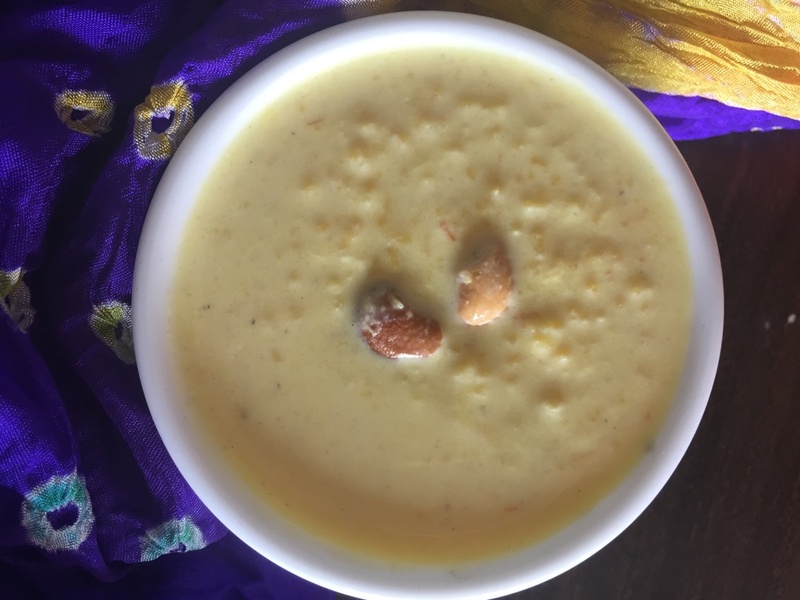 Soak saffron in warm milk for 2 mins and add it. Now heat ghee, fry the dry fruits. Add half of the fry fruits to the Khichdo. When the mixture is semi solid, turn off. Add the spice powders. serve warm or hot with remaining nuts sprinkled on the top. As mentioned in yesterday's post, Pongal meal is a rather elaborate affair. Sankranti, Pongal, Uttarayan, Lohri - various names given to the festival celebrated over 13th/14th of Jan every year to mark the end of the harvest season and salute the Sun God as he enters the Makar (Or Capricorn) sun sign. Its also a farmers festival in which the sun of the soil pays homage to the soil and so most of the feasting is done using local produce. 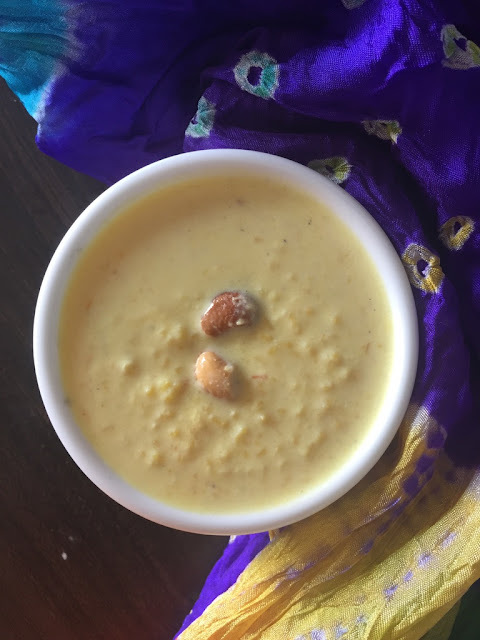 Pongal as its celebrated in Tamil nadu is known for both the name of the festival and the sweet & savoury versions of the dish. Rice being the principal crop of the region, the eats are made primarily with rice. Similarly, Til (sesame) is used in Northern India & Maharashtra in the form of Gajak / Til Tikki & Til Gud respectively, while the same oil seed - Ellu (in kannada) / sesame seed is ostensibly used in a wonderful trail mix called "Sankranti Ellu Bella" in Karnataka region, more so Bangalore - Mysore regions. 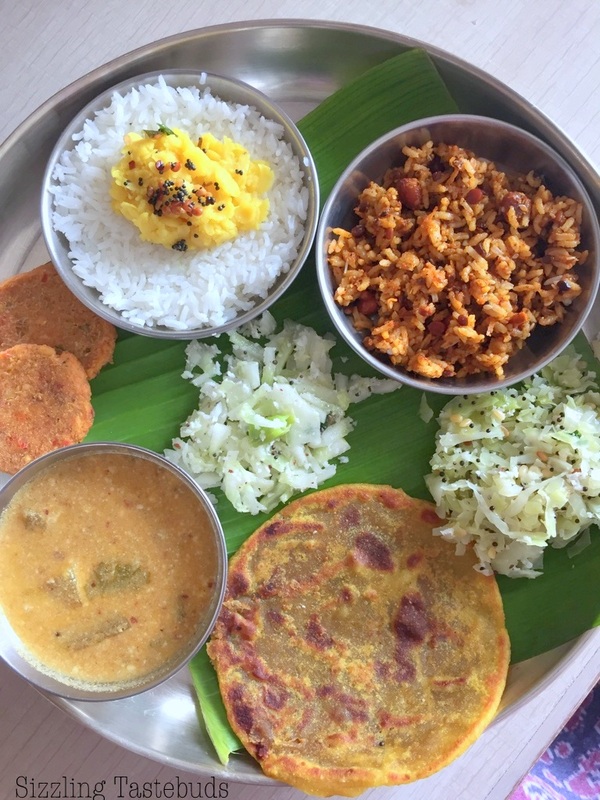 Today's is a mini meal we generally make for Pongal & Ugadi too. Only difference is no Mor Kozhambu (veggies in spiced yoghurt gravy) or Rasam (spiced lentil broth) is made on Pongal. 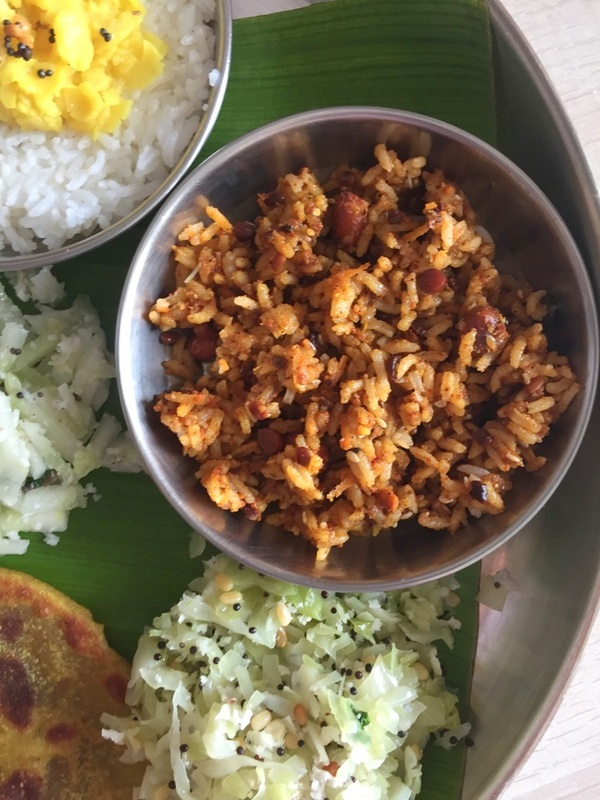 On Pongal in fact, we make 7-kari kootu ( a medley of 7 veggies in a spiced lentil stew), along with this mini meal. 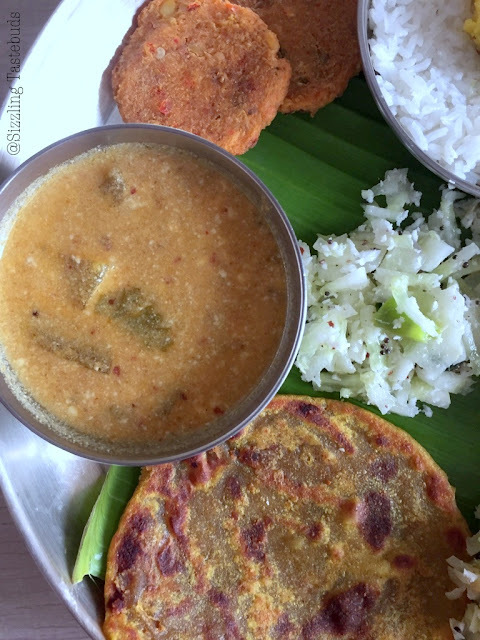 Lets get to today's mini festive meal with Baked (and non fried) Masala Vadai (baked spiced lentil fritter). It surely added a zing to the usual Paruppu Vadai. I didnt add any onion-garlic to this baked vadai as it was for a festival meal, but one could add in if preferred. The baking time would differ then. 5) Divide into equal lemon sized balls and pat gently into a small patty. FLatter vadais make it easier to bake. Makes 20- 25 approx. 6) Meanwhile pre-heat oven to 190 C. Spray oil on the prepared sheet & bake for 12 mins, flip and bake again for 6-7 mins till they are crisp around the edges. 7) Serve immediately or store in an airtight container. 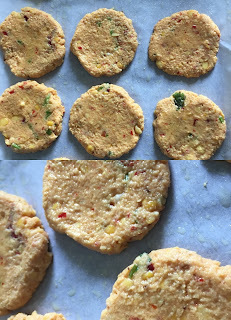 2) Oven baking time differ from oven to oven depending on the moisture of the batter and thickness of the vadai, so reduce/increase time accordingly. This week we present some festival recipes. 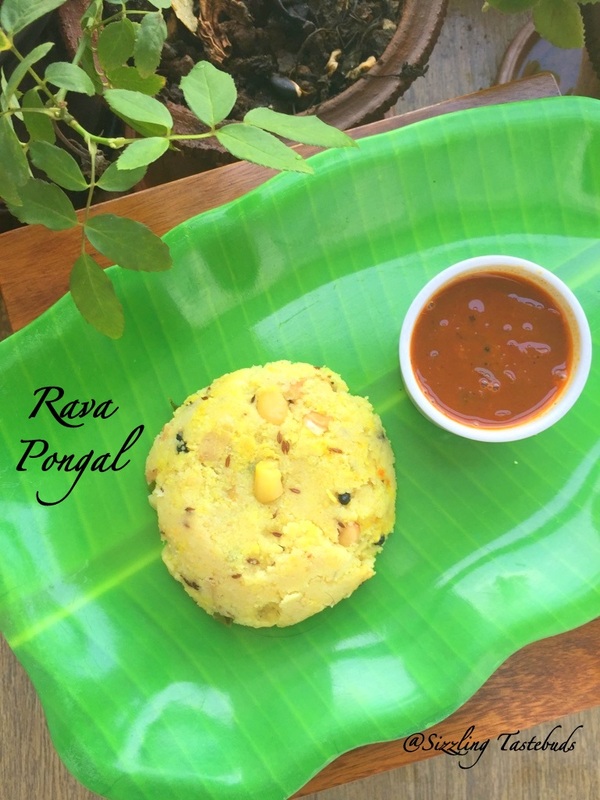 And its a savoury dish thats served in Pongal at our home. 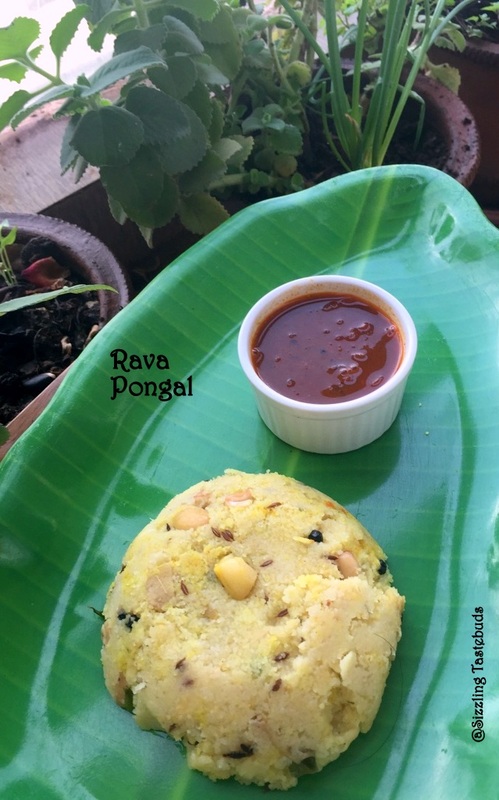 Kids are now getting picky with the usual Ven Pongal & Chakkarai Pongal varieties, so we have ventured to make other varieties on festival days - both from an intention to consume millets / whole grains and also as a break from the usual fare. Today, do enjoy this Rava Pongal that Amma made and I loved to click (what bliss, right? ;)) It's a signature dish of Amma's which she learnt from my youngest aunt (Mami) who makes this pongal spot on, every time we visit her! Dry roast cumin, pepper. Powder this coarsely with the ginger & curry leaves (without any water). In a pan, heat 1 tsp. Roast the moong dal till nice aroma wafts out. Transfer to a plate. Soak the moong dal in 1/2 cup of water for 20 mins. In the same pan, add 2 TBSP more of rava / sooji and roast like you would roast for Upma. Drain the water and reserve it. In a non stick pan, add the remaining ghee, fry cashew. Add hing, rava, salt. stir well. Cook with 2 cups of reserved hot water (adding more hot water to make up 2 cups totally). Once the rava is cooked, add the powdered cumin-ginger-curry leaves-pepper mixture, moong dal and mix well. Cook covered for 1 more min till it reaches Upma consistency (porridge like but not too runny or too dry).